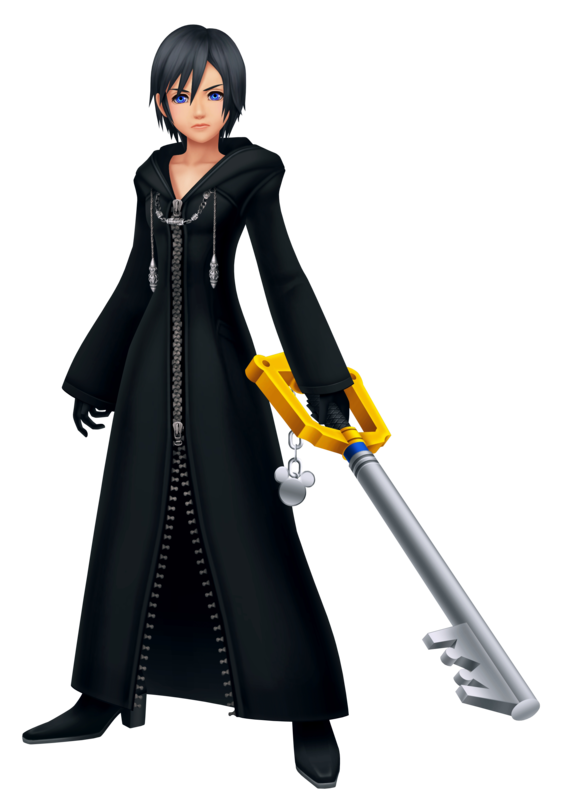 The XIV member of the Organization, Xion joined a week after Roxas did. She was a mute at first, saying nothing and keeping her face hidden underneath her cloak's large hood. A month and several missions alongside Roxas later she finally speaks, uttering Roxas's name as she reveals her face. She is a girl Roxas's age with black hair and radiant blue eyes, and much like Roxas - a Wielder of the Keyblade. No sooner do the two become friends, however, does Roxas fall into a coma, leaving Xion on her lonesome with Axel still away in Castle Oblivion. The girl visits Roxas daily and each day leaves a seashell by his pillow in hopes he'd wake up. He does eventually, yet at the same time Xion goes missing. It is not until Axel returns that the two go looking for Xion and discover the truth along with the girl. Having lost her ability to Wield the Keyblade, Xion could not finish her mission and thus - couldn't return. Now that the mission is accomplished, however, she fears returning as without the Keyblade, she is useless to the Organization. A solution is offered by Axel for Roxas and Xion to team up and use Roxas's Keyblade. With the future seeming a bit brighter, Xion is determined to regain her lost ability as soon as possibly - for the two she now calls 'friends'. The friendship between them strengthens steadily until all three agree that they are in fact the best of friends. It is during that happy period of time that Xion begins having dreams. She suspects them to be Memories, yet finds it hard for them to be her own, especially since she doesn't remember her past before the Organization. She never remembers the dreams, yet whenever she wakes up she feels as though things aren't right. That notion is strengthened once Xion meets Riku. She fights him and loses and he, in response to realizing the truth about her, tells her her Keyblade is a sham and that she should leave the Organization. The shock causes Xion to eventually fall into a coma. Upon waking, the dreams are stronger and harsher than ever, leaving Xion with no choice but to go search for answers on her own, in Castle Oblivion. She is dragged back by Axel however, who discovered the truth about her as well. She is a Replica of Sora, the Hero of the Keyblade, who created Roxas as his Nobody when he became a Heartless. The dreams she sees are actually Sora's Memories, leaking into Roxas. From him they pass to Xion and shape her according to a girl from Sora's childhood. It is not the only thing Xion takes from Roxas, however, and the girl grows ever stronger while Roxas loses strength in an alarming rate. When even the Organization are set on throwing Xion and Roxas against each other in the hopes one would fully absorb the other's strength, Xion seeks out Sora and meets with Naminé. Naminé then explains Xion's relation to Sora and how things can be set straight, yet at a price. As Xion originally lacked both a voice and a face, giving Sora his Memories back means Xion'd be lost, as the Memories are her foundation. Seeing how her existence means Roxas's demise, Xion realizes what needs to be done and lets Axel drag her back one last time after a fierce battle between the two. She undergoes a transformation at Xemnas's hands and is sent after Roxas. When she meets him, she is no longer herself, having absorbed enough of Sora's Memories to actually look like him. She forces Roxas to fight her and loses, only to seem content with the outcome. With her gone, Roxas is safe and is able to regain his strength, while she fades away into blissful oblivion in the depths of everyone's Memories. In her final moments she comforts him, begging him to never forget that he and Axel are her two best of friends. Those precious Memories Roxas was rapidly losing sight of will never be lost. They will continue being, safe forever - inside Sora, to whom Xion returned. With Xion sharing Roxas's weapon, the Keyblade, comes her sharing his fighting style down to their joke weapons. Despite her fragile appearance, Xion is as formidable a fighter as Roxas and can hold out as well as he does when push comes to shove. She's agile and nimble yet still powerful, though she tends to use magic more often than Roxas does. Not falling behind Roxas in any way, Xion's own version of the Event Horizon Limit Break is just as devastating as the other Wielder's and is a deadly tool at her disposal when she is on her last legs. A stranger to some but familiar to others; the girl with raven locks and the face of another and another. As she sits with her friends atop the Twilight Town clock tower - their special place - she seems to notice something in the distance, and looks out towards it with a smile forming on her lips. The only thing she would say would be the name of a boy who haunts her dreams, her day and night, and of whom she is one in the same - Sora. A replica of Sora created from the memories Xemnas stole from him during their encounter in Hollow Bastion, Xion was created to act as a failsafe should Roxas and Sora lose their worth. 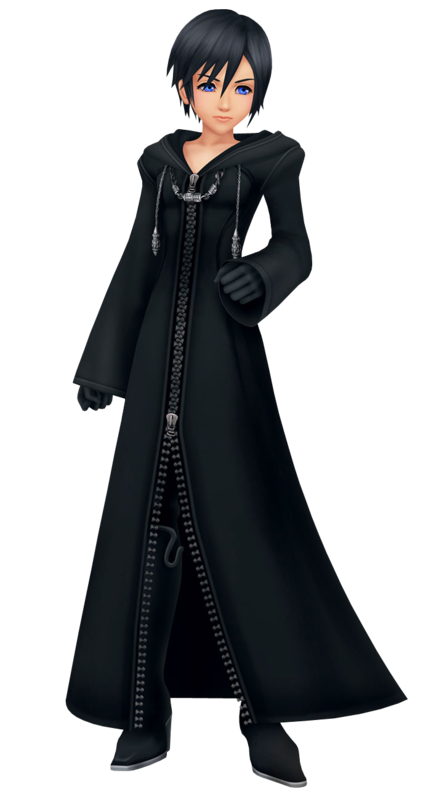 She assumes the form of a hooded puppet as default, but appears as an individual connected to Sora of whom the viewer has strongest memories of, though Roxas and a select few see her as a black-haired girl. Realizing that she shouldn't have existed and she was only harming her friends, she allowed Roxas to defeat her and absorb the memories she had taken from him and now rests within Sora. Sora was chasing after Naminé in The World That Never Was so he could finally give her the message she wanted to hear, but when he finally caught up, Xion appeared in her place. Although he didn't know who she was, something about her resonated within Sora and caused him to cry, and Xion dashed off in an instant. Xion appears to Riku within the depths of Sora's heart to ask him a question: "What do you wish?" Satisfied with his answer, she fades away.